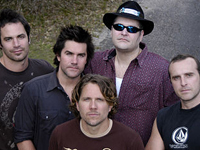 A New York-based blues-rock quartet formed in 1988 by singer/harmonica player John Popper, guitarist Chan Kinchla, bassist Bobby Sheehan, and drummer Brendan Hill, Blues Traveler was part of a revival of the extended jamming style of ’60s and ’70s groups like the Grateful Dead and Led Zeppelin. Signed to A&M, they released their first album, Blues Traveler, in May 1990 and followed it with Travelers & Thieves in September 1991. Popper was in a serious car accident in 1992, leaving him unable to perform for a number of months. Fortunately, he recovered, yet he still had to perform in a wheelchair for a period of time. In April 1993, Blues Traveler released its third album, Save His Soul, which became its first to make the Top 100. Blues Traveler’s aptly named fourth album, Four, released in September 1994, at first looked like a sales disappointment, but it rebounded in 1995 when “Run-Around,” a single taken from it, became the group’s first chart hit. “Run-Around” became one of the biggest singles of 1995, spending nearly a full year on the charts and sending Four into quintuple platinum status. As the group prepared the follow-up to Four, Blues Traveler released the live double-album Live From the Fall in the summer of 1996. The group returned in the summer of 1997 with its fifth studio album, Straight on Till Morning. After completing his 1999 debut solo effort Zygote, Popper — who’d been experiencing chest pains for months — was forced to undergo an angioplasty; weeks later, tragedy struck on August 20, 1999, when Sheehan was found dead in his New Orleans home. He was just 31 years old.